And here we are on the last day of 2011. What a great year this was! This year was the beginning of Recycle Brevard! After the landfill tour we took with Brevard County Solid Waste Management Department Recycling Educator Erin LeClair back in February, it all started. Step one was to create this blog and the Recycle Brevard Facebook page. Then, Brevard County Parks and Recreation Environmental Program Coordinator Susan Boorse invited us to participate in the Merritt Island Rotary Park Open House. It was the first time we were out talking to people about the 3Rs. That first event helped us to get to know more people involved with the same cause in Brevard County. I became a member of the Keep Brevard Beautiful Central Chapter and we started to work toward local other projects and events with the goal of bringing awareness to residents and information to all on reusing, reducing, and recycling. During the summer we went on a trip around Europe and it was a priceless experience to see and learn about recycling habits in the countries and cities we visited. Once we came back, it was time to organize our first America Recycles Day. I became a member of the Brevard Community College Green Team of Cocoa. We contacted the Rotaract group also of Cocoa and they agreed to help with the event. We prepared a scavenger hunt activity to get Manatee Elementary students involved in collecting recyclables needed for the event. We were able to receive a resolution from the Brevard County Board of County Commissioners at the November 1st meeting proclaiming November 15th, 2011 America Recycles Day in Brevard County. Getting it all together for the event kept us extremely busy, but it was very rewarding in the end. 4 The Kids of Brevard received a truck load of toys for kids in need in our county and we planted the seed of recycling in the hearts and minds of our residents. We also had the opportunity of participating in other events too: the Harvest Festival in Viera and Festival of Trees in Melbourne. Since we were going to events, we purchased our first banner that we can take anywhere we go. Besides the events, we organized our first recycling project in partnership with Redberry and Viera High School. We acquired our first recycle bins that we personalized and can now take wherever we go. Because of our involvement in all of those in addition to the online channel created, we got some media coverage, which helped in spreading the word. Looking back at the beginning of the year, it is gratifying to see how much we have accomplished in our first year. We are looking forward to what 2012 will bring! Cheers everyone and best wishes for an awesome New Year! The silent auction at Redberry's closed our Make Art, Not Trash! project in partnership with Redberry and Viera High School. The project was really great and we were lucky to have a lot of support coming from the community! Thank you to all Redberry customers who participated in the project by placing their spoons in the collection bins. Thank you to Redberry’s Manager, Loanna Pham, who made the collection of used spoons possible and supported the project all the way through. Thank you to Dr. West, Viera High School 3D Art teacher, who agreed with using Redberry’s recycled spoons in her class to produce art pieces. Each one of you helped reduce the amount of trash sent to our landfill and in turn created really unique pieces of art that our community has now the opportunity to appreciate. Thank you! And finally, thank you for the ones who were able to participate placing your bids. Bidders have already been contacted and they should pick up their sculptures at Redberry's after emailing me. All the proceeds will go to the Viera High School Art Department and that will help Art teachers and students alike! I am currently working toward a project that will bring information about the three-Rs (reduce, reuse, and recycle) as well as materials (brown paper bags, plastic bags, strawberry containers, nursery pots, clean egg cartons, cardboard boxes, etc.) to share with the community. As part of this project I will also collect unwanted, recyclable and Terracycle items. It will be a true Recycle Brevard! 101. More details will follow. The idea came up once we hit 101 supporters on Facebook. No better way to celebrate 101 than having a 101 project to start the new year. Thanksgiving is the national Turkey Day and the day all the heavy cooking starts, warming up for the Holidays in December. Oil is most certainly one of the ingredients used when preparing those meals, like the famous deep-fried turkey that uses three to five gallons of peanut oil. After those meals are cooked, what should you do with all that oil? What is the best way for you to dispose of it? Store the oil in the original container for reuse. Strain out any particles and freeze. Oil can be kept for up to six months and reused for up to six hours of fry time. Freeze it and then throw the hardened oil away on trash day. Mix it with unscented kitty litter, sawdust, or sand to solidify the oil. Double-bag it and dispose of it in the trash. Avoid scented or disinfectant types of kitty litter as they can react with the oil and cause afire. Place small amounts of oil in tightly sealed, unbreakable containers in the trash. It is not recommended to dispose of large amounts in trash as containers may leak, causing problems with garbage trucks and at solid waste facilities, adds East Bay Municipal Utility District. Use a paper towel to wipe up small amounts of cooking oil, such as meat drippings. Throw the paper towels in the trash. Recycle it. Cooking oil can be recycled into soap, bio-fuel, cosmetics and stockfeed, and biodiesel. The Brevard County Recyclopedia lists Green Oil Recyclers (321-403-1771). They accept up to 1,000 gallons vegetable, canola, peanut, sunflower oil, etc. Contact them to arrange for a pick up -- yes, they will come to you and pick it up! Another option suggested on the county's solid waste management page is to contact local recycler Elias Victor at 321-298-1846. As posted on Wikipedia, proper disposal of used cooking oil is an important waste-management concern. Oil is lighter than water and tends to spread into thin and broad membranes which hinder the oxygenation of water. Because of this, a single liter of oil can contaminate as much as 1 million liters of water. Also, oil can congeal on pipes provoking blockages. "Although it covers more than 70 percent of the surface of the Earth, water is one of the most precious natural resources of our planet. The reason being that about 97 percent of it is salty, and therefore undrinkable, a further 2 percent is locked in glaciers and polar ice caps, thus leaving just about 1 percent of it useful for drinking and cooking. Apart from clean drinking water, we also need to keep the waters in the oceans, rivers, and lakes unpolluted because otherwise it harms the very planet we survive on. With human populations increasing rapidly it has resulted in us polluting all the water resources of our planet, so much so, precious and unique organisms and ecosystems are being harmed and are even dying at an alarming rate" (http://www.buzzle.com/articles/ways-to-prevent-water-pollution.html). Oil is one of the types of pollution we need to worry about and “one of the greatest sources of oil pollution is people who pour various cooking oils and grease down the sink drains in their homes” (http://greenliving.lovetoknow.com/Types_of_Ocean_Pollution). So it is best to keep grease and food scraps out of your sink and toilet drains. Make sure to scrape food scraps, oil and grease from kitchen utensils and equipment before washing to help keep grease out of wash water. Let's help the environment and properly dispose of the oil we use. From September 9th to the 30th we have picked up a total of 3,959 spoons--very close to our goal of 4,000, but a lot for only three weeks of collection. Thank you all who participated in this project by placing their spoons in the collection bins! Ms. West's 3D Art students will work now on the pieces that should make to Redberry's walls around mid-October. Only three 3'x5' sculptures will be at display, but the students have been working on other pieces as well. All spoons should get to be re-used. Less for the landfill and more raw material for the Art class! We should be bringing selected sculptures to Redberry's around mid-October. Make sure to check them out. Toward the end of the month we should be having a silent auction that will benefit Viera High School Art class. Together with Keep Breavard Beautiful we will create a scarecrow completely out of recycled material to participate in the Scarecrow Stroll & Harvest Festival this coming October. This two-part event starts on October 1st, when the scarecrows will be at display either at the Viera Voice office or at various participating businesses. The Harvest Festival, when all scarecrows meet, will be on Saturday, October 15th at the Viera Hospital courtyard. The name of our scarecrow: RecyCrow. Apart from the frame that was provided by Viera Voice Newspaper, all the material, recyclables and non-recyclables, will be coming from our own garages, closets, and cabinets--another chance to reuse the selected items. We started to separate candidates that might be used in our RecyCrow: containers, packaging, plastic bottles, bottle caps, brown paper bags, plastic bags, egg cartons, to name a few. We expect to make a good impression with our RecyCrow, so come on to see us at the event! The Make Art, Not Trash! project in partnership with Redberry and Viera High School is going really well! One of our local newspapers, Hometown News, recently published an article on the project. Recycle Brevard turns plastic spoons into sculptures tells the story of this project and reiterates its ultimate goal: to make locals aware of the importance of recycling. We have collected a total of 2,875 plastic spoons so far and we still have one more week of collection to go. Our goal is to hit at least a total of 4,000 spoons collected and will need all the help from Redberry's customers we can get in order to achieve that. Collection of spoons end this week. If you have not been to Redberry's yet, this is your chance to participate in this project. In the meantime, Viera High School students from Ms. West 3D Art class have been busy carefully washing the rinsed spoons already delivered to them. They started to create beautiful sculptures to try out the new material, getting ready to build the three pieces that will color Redberry's walls. They should have the three sculptures ready sometime in October. After the sculptures make it to Redberry's, we will be having a silent auction and you will be invited to bid on your favorite piece. The winner will not only take home a piece of art, but will also help to keep the spoons out of the landfill. Tonight was the third spoon collection day at Redberry's and we noticed that one of the bins, the one next to their trash can, had mostly spoons in it both last night and tonight. It seems like the secret is to place the bins with respective signs right next to a trash can. That way customers come to one spot and get rid of it all at once. All in all we have collected a total of 745 spoons is just three days! Wonderful! When I was collecting the bags tonight, a girl walked towards me holding three spoons to throw in our bin. It was great to see that! Customers are really helping the project and we cannot thank them enough. We hope that this project is just the beginning and in the future more businesses and people in the community will embrace reusing/repurposing and recycling. On the second Saturday of every month, we go to Pelican Beach Park in Satellite Beach not only to enjoy a morning at the beach but also to help in the beach clean up organized by Judy Amoroso DelaRosa. Judy brings supplies provided by Keep Brevard Beautiful and we bring the recycle bin so any recyclable items found on the beach can be placed in the recycle bin instead of the trash cans. The first time we brought the recycle bin we did not collect much. I think that was partly because we did not bring any signs to put next to the bin. But for this September clean up, I made a sign and we got a lot more into the bin! I hope this shows a trend of increasing the recycling rate at least at that specific clean up. The bins for our "Make Art, not Trash!" project were delivered to Redberry yesterday and tonight we start collecting spoons. With the bins now in place, we just need YOU to participate! Help us reuse some of those spoons that would otherwise end up in our landfills. On your next visit to Redberry's, remember to give your spoons a quick wipe and deposit them in the designated bins. Thank you! It was a great day yesterday and a lot got accomplished! I am now officially a member of Keep Brevard Beautiful Central Chapter. At the meeting I talked about the latest on our America Recycles Day event and put out a request for brown paper bags (to use in our pavilion), a Christmas tree (for our participation in the Festival of Trees at the King Center), and volunteers. We do need volunteers! So after meeting with the great folks from KBB Central Chapter, I went to BCC Cocoa for the Rotaract Club meeting to explain the event and see if they would be interested in helping out. They were all for it and Troy is chairing for us! With his help I think we will get all the volunteers we need and maybe more. Besides volunteers, we are still looking for an artist to participate. Barb from KBB sent out a message to the other KBBCC members. Nicki, who is helping me organize the event, contacted the current Art teacher at Manatee Elementary. We should be able to find someone interested... Fingers crossed! Nicki has also been contacting media (newspaper and radio) to get some coverage for the event. We have had some positive feedback and will probably get some support in that area. Now what we need is attendees! Moving on with still a lot of work to do and plenty to organize! 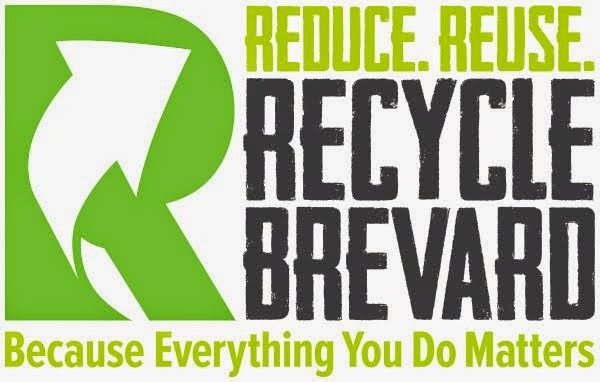 Recycle Brevard! is partnering with Redberry in a recycling project to REUSE Redberry’s PLASTIC SPOONS in sculptures created by 3D Art students from Viera High School. Plastic spoons are NOT recyclable and they go straight to the landfills. Landfills are expensive to build and maintain, and not many people would like to live next to one. In order to maximize the existing landfills and avoid needing to create new ones, we must reduce what gets sent to them. One of the ways to reduce what gets sent to landfills is by reusing materials, repurposing items to get at least one more use out of them. The goal of this project is to extend the life of those colorful spoons and use them as raw material for creating beautiful sculptures that will decorate Redberry’s walls. The collection bins are ready and will be delivered to Redberry's at The Avenue this week, by Friday Sepetember 9th, and we will be collecting spoons throughout the month of September. If you would like to participate, on your next visit to Redberry's please give your spoons a quick wipe and deposit them in the designated bins. Thank you! Our America Recycles Day event is in good shape, but in order to make it a success we will need lots of help! Now in September we will be at Brevard Community College (Cocoa campus) to participate in their Green Team and Rotaract Club meetings. We would like to invite them to join and assist with all the activities we will have at our Recycling Fun - Toy Swap/Drop Off event that will be on November 15th from 2pm to 6pm at Viera Regional Park (Rotary Pavilion). Besides that, we're using VolunteerSpot to make recruiting volunteers even easier. If YOU would like to lend a hand, please visit VolunteerSpot (America Recycles Day - Recycling Fun) to review the volunteer opportunities still open. From there you may sign up to help with the tasks that would most suit you and your availability. We visited the Zoo yesterday and saw they have new recycle bins in the cafe area. Very neat! Did you know that each year millions of trees and billions of gallons of water are used to create junk mail, most of which never gets recycled? There are several things you can do to reduce how much junk mail you receive. After using junk mail—and any other paper you don't need to keep—as scrap paper, recycle it. By reusing many of the products already created--such as aluminum, glass, paper, and plastic--we can reduce energy consumption. About 80% of what Americans throw away is recyclable, yet our recycling rate is just 28%. Source, Environmental Protection Agency. By reusing many of the products already created--such as aluminum, glass, paper, and plastic--we can reduce energy consumption. Recycling just one aluminum can saves enough energy to operate a TV for 3 hours. Source, Eco-Cycle. By reusing many of the products already created--such as aluminum, glass, paper, and plastic--we can reduce energy consumption. Americans throw away enough aluminum to rebuild our entire commercial fleet of airplanes every 3 months. Source, Environmental Defense Fund. By reusing many of the products already created--such as aluminum, glass, paper, and plastic--we can reduce energy consumption. If every household in the U.S. replaced just one roll of 1,000 sheet virgin fiber bathroom tissues with 100% recycled ones, we could save: 373,000 trees, 1.48 million cubic feet of landfill space, and 155 million gallons of water. Source, Seventh Generation Co.
By reusing many of the products already created--such as aluminum, glass, paper, and plastic--we can reduce energy consumption. The U.S. is 5% of the world's population, but uses 25% of its natural resources. Source, Environmental Protection Agency. By reusing many of the products already created--such as aluminum, glass, paper, and plastic--we can reduce energy consumption. Recycling glass instead of making it from silica sand reduces mining waste by 70%, water use by 50%, and air pollution by 20%. Source, Environmental Defense Fund. By reusing many of the products already created--such as aluminum, glass, paper, and plastic--we can reduce energy consumption. The energy saved each year by steel recycling is equal to the electrical power used by 18 million homes each year--or enough energy to last Los Angeles residents for 8 years. Source, Steel Recycling Institute. By reusing many of the products already created--such as aluminum, glass, paper, and plastic--we can reduce energy consumption. Recycling creates 6 times as many jobs as landfilling. Source, Colorado Recycles. The availability of clean water is one of the central issues of our time, and we all need to do our part to use this resource wisely. Saving water is simple! Turn the water off while brushing your teeth, washing your hands, and washing dishes. The Green Team is a special group of Zoo employees that work toward "inspiring our community to take action in natural resource conservation." This group is responsible for ensuring that the Zoo continues to be a sustainable organization and at the same time they help in educating those in the community on how they can make a difference. One of the things they do to bring information to the community is organize the Eco Friendly Fair Day once a year. It is a nice event that you should try to attend if you have not yet. We have invited the Zoo's Green Team to participate in our America Recycles Day event. We hope they are able to join us! Some good information here to digest, but from all that was listed above what do you already do and what would you be willing to do in order to improve the numbers presented? Not many posts happening recently, but a lot of emails, phone calls, and preparations being made. Yes, our reuse project and the America Recycles Day event have been shaping up nicely! On the Redberry’s project, I was able to find and purchase the two gray plastic bins that will be at the shop for collecting their used spoons. I could not find any local shops that had the bins to Redberry’s specifications, so I had to order them online. They arrived last Friday and are waiting to be personalized and then delivered to Redberry’s. I already got some material and am working on the personalization and project description that need to go on the bin – we will not have any material at the shop other than the bins. My goal is to deliver the bins by the beginning of next week and run the collection for the whole month of September. The spoons need to be retrieved from Redberry’s every night by 9pm and I need to rinse them and prepare a bag to take to Viera High School (VHS), which I will probably do once a week. The teacher at VHS, Ms. Susan West, asked me to make the first deliver after collecting at least 200 spoons. With all that, the first drop off should be happening into the second week of September. Ms. West estimates that her students will be using over 1,000 spoons to build three 3x5 colorful sculptures that should be ready toward the end of October. I can’t wait to see that! On the America Recycles Day event front, we have had a lot of activity. We secured a location for the event, more organizations joined in, and some were contacted but have not confirmed their participation yet. The event, Recycling Fun - Toy Swap and Drop Off, will be at the Viera Regional Park - Rotary Pavilion. Brevard County Parks and Recreation is co-sponsoring the event and will have a table at the pavilion. We have received confirmation also from the Suntree/Viera Public Library and Head Reference Librarian Nancy Garmer will be bringing materials to share and will be collecting books/magazines/DVDs. We have not received confirmation yet from the Brevard's Green Team, Keep Brevard Beautiful, or the Brevard Zoo's Green Team. Other organizations are still being contacted and we should be meeting with the students from BCC now in September. We have received confirmation that Pelly, the mascot pelican from Keep Brevard Beautiful, will come to cheer us up at the event! We have posted a “Call to Artists” on the Brevard Art News site to see if any local artists who use recycled material in their work would be interested in participating too, but have not heard back from any artists yet. If you would be interested, please contact me at Info AT RecycleBrevard.org. Nicki and I have been working on making the event known to the community. She prepared a paragraph to send to various local publications to be added to their calendars and I updated our website and made several posts on Facebook after creating the event on our page. We are also trying to get it added to some newsletters in the community so more families will be aware of the event. The event, Recycling Fun - Toy Swap and Drop Off, is currently on Facebook, on the America Recycles Day site (listed under 32940 zip code) and also on Eventful under Family, Neighborhood, and Outdoors categories. I need to start recruiting volunteers to help with all the games, activities, and set up/clean up. If you are local and would like to help, contact me at Info AT RecycleBrevard.org. A lot more to organize and a lot more to come! In the meantime, I researched, selected, and ordered a compost tumbler (and a book on composting – Let it Rot! ), reorganized the trash cans in the kitchen, and started my very own home and garden compost. I am proud that I finally got that started after a lot of reading, measuring, and planning. In the near future, I will dedicate some posts to my experience with this home project. Since August 11th Recycle Brevard! has had its own web address -- http://www.recyclebrevard.org/ -- and emails have been configured to use the new domain name! You may contact us at Info AT RecycleBrevard.org if you have any questions or some information to share. From this point on you will see posts made by Recycle Brevard Blog Author instead of MBOnline, but we are still the same in character, enthusiasm and goals. The past weeks have been incredibly busy. Between coming back from our long trip and getting regular life back on track again, I am organizing a recycling project with a local shop and our local High School, and putting together an event for America Recycles Day that happens on November 15th and is sponsored by Keep America Beautiful. Both the project and the event that I am working on are based on the "reuse" concept because "once is not enough." The project is to reuse colorful spoons from our local Redberry's in 3D art work created by Viera High School Art students. The spoons currently go straight into the trash can. The goal of the project is not only to give a longer and better life to those beautiful spoons keeping them out of our landfills, but also to bring information on the 3Rs and on the importance of recycling to as many people as possible in our community. Make Art, Not Trash! Planning is on-going, but we should start collecting the spoons right after school is back. The event is shaping up nicely too. My neighbor and friend, Nicki, is helping me with the details. We will be having a Toy Swap/Drop Off in our neighborhood. Again, the idea is to bring information to the community and get another use out of gently used toys. Erin LeClair from the Brevard County Recycling Program will be there; Joan Needelman from 4 The Kids of Brevard will be there to take home dropped off toys; the Brevard's Green Team, Keep Brevard Beautiful, and the Rotaract Club/Green Team from Brevard Community College may participate too. There is still a lot to be done, but I am getting some enthusiastic response, which is really motivating. Amidst all this I have not finalized my post on my impressions and experiences about recycling in Paris. That will be next! In the meantime, I am working on the project and event, trying to put into practice the idea that "once is not enough" in the community, but there are many other creative ways to do that. What is yours?